Dutch Invertuals challenges its designers to anticipate the world’s developments. The goal of the continuous interaction and dynamic crowdsourcing of ideas within the group is to rethink the role of design in relation to the future. The Eindhoven-based design studio first began as an exhibition at Milan’s Salone del Mobile in 2009. The intention of Wendy Plomp, the founder, curator, and art director of Dutch Invertuals, was to bring together various design fields and put together a single and strong presentation around a single central theme. Through the blending of various disciplines, the objective of the works was to tell a cohesive story about the future according to the designers involved in the project. Given its success, the collective decided to showcase during Dutch Design Week as well, and Milan and Eindhoven have been their main exhibition venues ever since. Both venues are stages where Dutch Invertuals displays the result of research carried out within the specific theme of the exhibition. As Plomp explains, the show represents a series of reflections frozen in time, triggered by dialogue, interaction, and an active approach within the group. Each show is meant to be thought-provoking and future-oriented. The aim is to encourage each other to think outside the box, explore the changing spirit of the age, and reacting to it in a creative way. The crucial role that research plays in each Dutch Invertuals exhibition is one of the main reasons that prompts designers to join the platform. The vibrant interaction among members and the deep reflective environment form a rich academic tradition that designers are extremely interested in. Every two weeks, the group gathers to share experiences and knowledge concerning materials and techniques and to offer feedback, critique, and advice on individual works. Since experimentation is necessary to explore different ways of expressing the theme of the exhibition, designers are encouraged to venture out into fields that they are not familiar with. This offers great opportunities for personal development – and for the maturing of Dutch Invertuals itself. For the Revaluate exhibition in Eindhoven in 2013, for instance, the collective actively collaborated with the foundry at Beeldenstorm, the European Ceramic Workcenter, and the Leerdam Glass Museum. The project developed fascinating research, which was followed by a great deal of experimentation and the creation of many intriguing objects. In addition, the heterogeneity of the platform is of added value. ‘Beginners bring their enthusiasm to the experiments and veterans compensate with their practicality’, explains Plomp. Encouraging and stimulating each other pushes the approach towards new insights, concepts, and creations, and takes the collective work to another level. To maintain a vibrant and inspiring environment, the founder carefully selects her colleagues according to their ambition, experimentation, passion, and work mentality. It is important to keep the group heterogeneous, with different backgrounds, abilities, and nationalities. ‘Dutch Invertuals is about mentality and willingness to collaborate. It is not limited to the Dutch’, she adds. The studio is becoming more and more international, in part due to the increasing number of international students at the academies, where graduation shows have become pulsating scouting environments. Although the coming edition of the Salone will be the eighth exhibition of Dutch Invertuals in Milan, Wendy is proud to say that it feels refreshing to present a completely new presentation every time. ‘Each show wants to tell a story; the world is continuously evolving, which results in a lot of food for thought – how will we adapt to the transformation of our identities, habits, and traditions? 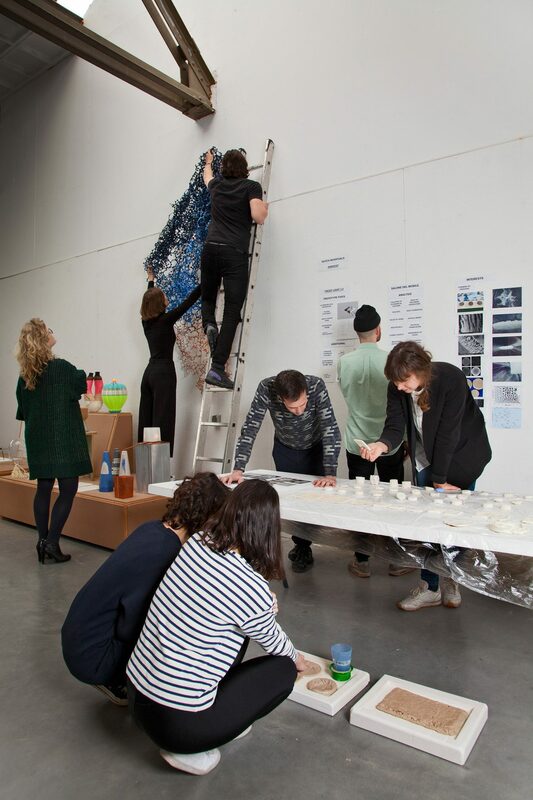 How will we interpret this?’ To the platform, the Salone represents the professional fulfilment of research carried out and exhibited at Dutch Design Week in Eindhoven. Thanks to its wide ranging, cosmopolitan audience, the Salone del Mobile is an excellent international exhibition venue – for the collective to showcase, as well as to explore and gain different insights on design. Despite working on other projects simultaneously, Milano and Eindhoven remain the most important appointments on the annual agenda for the group’s members. As for the future, Dutch Invertuals aims at spreading its mentality and its enthusiasm around the world, and opening itself to new teams of designers with the same unrelenting impulse to collaborate, create, and innovate. This article was published in The Dots #14 and distributed during the Milan Design Week 2017. Find more information about the presentation of Dutch Invertuals during the Milan Design Week 2017 here.